Tennyson excelled at penning short lyrics, such as "Break, Break, Break", "The Charge of the Light Brigade", "Tears, Idle Tears", and "Crossing the Bar". Much of his verse was based on classical mythological themes, such as Ulysses, although "In Memoriam A.H.H." was written to commemorate his friend Arthur Hallam, a fellow poet and student at Trinity College, Cambridge, after he died of a stroke at the age of 22. Tennyson also wrote some notable blank verse including Idylls of the King, "Ulysses", and "Tithonus". During his career, Tennyson attempted drama, but his plays enjoyed little success. A number of phrases from Tennyson's work have become commonplaces of the English language, including "Nature, red in tooth and claw" (In Memoriam A.H.H. ), "'Tis better to have loved and lost / Than never to have loved at all", "Theirs not to reason why, / Theirs but to do and die", "My strength is as the strength of ten, / Because my heart is pure", "To strive, to seek, to find, and not to yield", "Knowledge comes, but Wisdom lingers", and "The old order changeth, yielding place to new". He is the ninth most frequently quoted writer in The Oxford Dictionary of Quotations. Tennyson was born on 6 August 1809 in Somersby, Lincolnshire, England. He was born into a middle-class line of Tennysons, but also had a noble and royal ancestry. 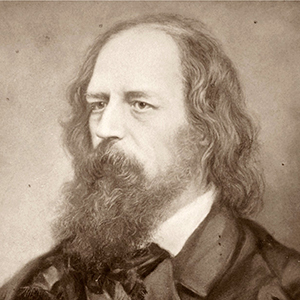 In 1833 Tennyson published his second book of poetry, which notably included the first version of The Lady of Shalott. The volume met heavy criticism, which so discouraged Tennyson that he did not publish again for ten years, although he did continue to write. That same year, Hallam died suddenly and unexpectedly after suffering a cerebral haemorrhage while on a holiday in Vienna. Hallam's death had a profound impact on Tennyson and inspired several poems, including "In the Valley of Cauteretz" and In Memoriam A.H.H., a long poem detailing the "Way of the Soul". Tennyson and his family were allowed to stay in the rectory for some time, but later moved to Beech Hill Park, High Beach, deep within Epping Forest, Essex, about 1837. Tennyson’s son recalled: “there was a pond in the park on which in winter my father might be seen skating, sailing about on the ice in his long blue cloak. He liked the nearness of London, whither he resorted to see his friends, but he could not stay in town even for a night, his mother being in such a nervous state that he did not like to leave her..." Tennyson befriended a Dr Allen, who ran a nearby asylum whose patients then included the poet John Clare. An unwise investment in Dr Allen's ecclesiastical wood-carving enterprise soon led to the loss of much of the family fortune, and led to a bout of serious depression. Tennyson moved to London in 1840 and lived for a time at Chapel House, Twickenham. In 1850, after William Wordsworth's death and Samuel Rogers' refusal, Tennyson was appointed to the position of Poet Laureate; Elizabeth Barrett Browning and Leigh Hunt had also been considered. He held the position until his own death in 1892, the longest tenure of any laureate before or since. Tennyson fulfilled the requirements of this position by turning out appropriate but often uninspired verse, such as a poem of greeting to Princess Alexandra of Denmark when she arrived in Britain to marry the future King Edward VII. In 1855, Tennyson produced one of his best-known works, "The Charge of the Light Brigade", a dramatic tribute to the British cavalrymen involved in an ill-advised charge on 25 October 1854, during the Crimean War. Other esteemed works written in the post of Poet Laureate include "Ode on the Death of the Duke of Wellington" and "Ode Sung at the Opening of the International Exhibition". Tennyson also wrote a substantial quantity of unofficial political verse, from the bellicose "Form, Riflemen, Form", on the French crisis of 1859 and the Creation of the Volunteer Force, to "Steersman, be not precipitate in thine act/of steering", deploring Gladstone's Home Rule Bill. Tennyson was a craftsman who polished and revised his manuscripts extensively, to the point where his efforts at self-editing were described by his contemporary Robert Browning as "insane", symptomatic of "mental infirmity". His complex compositional practice and frequent redrafting also demonstrates a dynamic relationship between images and text, as can be seen in the many notebooks he worked in. Few poets have used such a variety of styles with such an exact understanding of metre; like many Victorian poets, he experimented in adapting the quantitative metres of Greek and Latin poetry to English. He reflects the Victorian period of his maturity in his feeling for order and his tendency towards moralising. He also reflects a concern common among Victorian writers in being troubled by the conflict between religious faith and expanding scientific knowledge. Like many writers who write a great deal over a long time, his poetry is occasionally uninspired, but his personality rings throughout all his works. Tennyson possessed a strong poetic power, which his early readers often attributed to his "Englishness" and his masculinity. Well known among his longer works are Maud and Idylls of the King, the latter arguably the most famous Victorian adaptation of the legend of King Arthur and the Knights of the Round Table. A common thread of grief, melancholy, and loss connects much of his poetry (including Mariana, The Lotos Eaters, Tears, Idle Tears, In Memoriam), possibly reflecting Tennyson's own lifelong struggle with debilitating depression. T. S. Eliot famously described Tennyson as "the saddest of all English poets", whose technical mastery of verse and language provided a "surface" to his poetry's "depths, to the abyss of sorrow". Other poets such as W. H. Auden maintained a more critical stance, stating that Tennyson was the "stupidest" of all the English poets, adding that: "There was little about melancholia he didn't know; there was little else that he did." An heraldic achievement of Alfred, Lord Tennyson exists in an 1884 stained-glass window in the Hall of Trinity College, Cambridge, showing arms: Gules, a bend nebuly or thereon a chaplet vert between three leopard's faces jessant-de-lys of the second; Crest: A dexter arm in armour the hand in a gauntlet or grasping a broken tilting spear enfiled with a garland of laurel; Supporters: Two leopards rampant guardant gules semée de lys and ducally crowned or; Motto: Respiciens Prospiciens ("Looking backwards (is) looking forwards"). These are a difference of the arms of Thomas Tenison (1636–1715), Archbishop of Canterbury, themselves a difference of the arms of the 13th-century Denys family of Glamorgan and Siston in Gloucestershire, themselves a difference of the arms of Thomas de Cantilupe (c. 1218 – 1282), Bishop of Hereford, henceforth the arms of the See of Hereford; the name "Tennyson" signifies "Denys's son", although no connection between the two families is recorded. This article uses material from the Wikipedia article Alfred, Lord Tennyson, which is released under the Creative Commons Attribution-Share-Alike License 3.0. ( view authors).